The bridge was suspended from cables which were loose and while they were being tightened, the whole thing collapsed, Marco Rubio wrote on Twitter. Ten people were taken to hospital and two trucks that were completely crushed, reports. 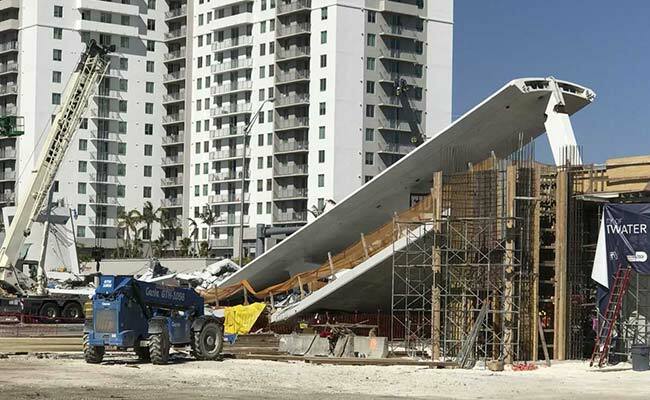 Miami, United States: The death toll from the collapse of a pedestrian bridge has risen to at least six, Miami police said Friday as crews searched under the huge concrete slabs which fell onto a busy highway. The operation has shifted from rescue to body recovery, with engineers fearing the support structures at either end of the bridge could also come down, Miami-Dade police spokesman Alvaro Zabaleta told reporters. Video footage on CNN shows the concrete structure suddenly crashing onto the road below. The bridge had only been installed on Saturday, ahead of its planned opening in 2019. Isabella Carrasco, who arrived at the scene shortly afterwards, told CNN some cars were completely crushed and that there was "a lot of debris everywhere." She saw one woman get out of a car that was "just nicked" and rescue personnel performing life-saving CPR on another person in the road. Another shaken driver, Lynnell Collins, told CNN he was about to make a right turn when "the whole thing really just came down." "In our 40-year history, nothing like this has ever happened before." "Continuing to monitor the heartbreaking bridge collapse at FIU - so tragic," President Donald Trump wrote on Twitter. "Many brave First Responders rushed in to save lives. Thank you for your courage. Praying this evening for all who are affected," he said.